For any dedicated petrolhead, there is one name that will guarantee to excite the moment it is mentioned. And that is the BMW E9 3.0 CSL. Even whispering its name is enough to make any BWM fan look into the distance, hoping for a glimpse of the 1970s legend. Introduced in 1972, the 3.0 CSL coupe was a homologation special for the European Touring Car Championship. In a determined effort to produce a competitive car, BMW used a thiner gauge steel body, which when combined with the aluminium alloy doors, bonnet, boot and perspex side windows, made for a very light car. 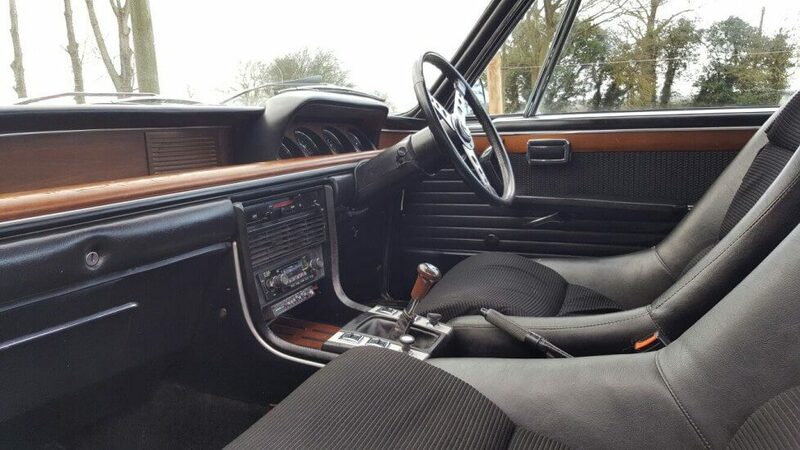 The Bavarian firms drive to reduce weight also saw the removal of the interior trim and soundproofing. The new light weight racer was initially fitted with the 3.0ltr (2,985cc) 180BHP overhead cam engine. This was increased to a shade over 3.0ltr (3,003cc) and 200BHP before jumping to 3.2ltr (3,153cc) and 206BHP in 1973. Early models were fitted with twin Zenith carbs which were then dropped in favour of fuel injection. 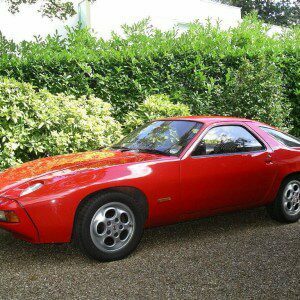 All models were also fitted with four speed manual Getrag transmissions. Chris Amon driving his BMW E9 3.0 CSL at the 1973 Nürburgring 6 Hours Race. Note the body kit and wings that lead to the Batmobile nickname. The light weight performance coupe went toe to toe with the Ford Capri in Europe and went on to achieve wins at the 6 Hours Race at the Nürburgring in 1973. 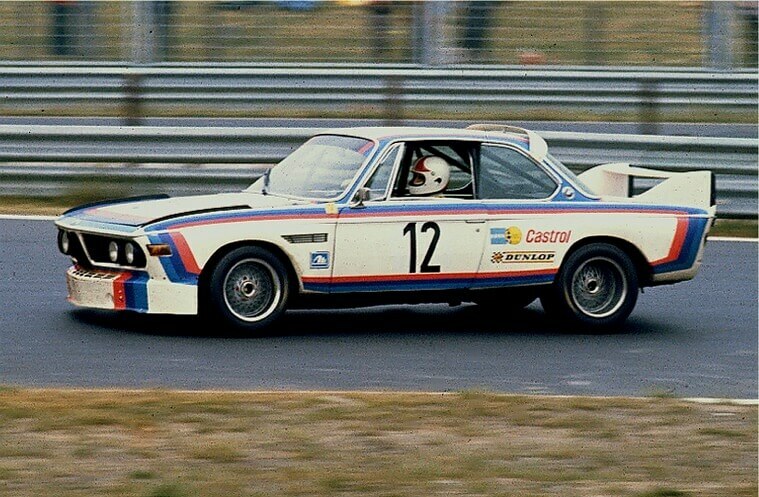 A BMW 3.0 CSL driven by Toine Hezemans also won the prestigious 1973 European Touring Car Championship. Hezemans also co-drove a CSL with Dieter Quester to a class win at Le Mans in 1973. Ford counterpunched in 1974 but from 1975 onwards, the CSL, now dubbed the ‘Batmobiles’ thanks to their radical aero body kits, won five consecutive European Touring Car Championships. These wins forever cemented the BMW 3.0 CSL Batmobile as one of Touring Cars all time legends. 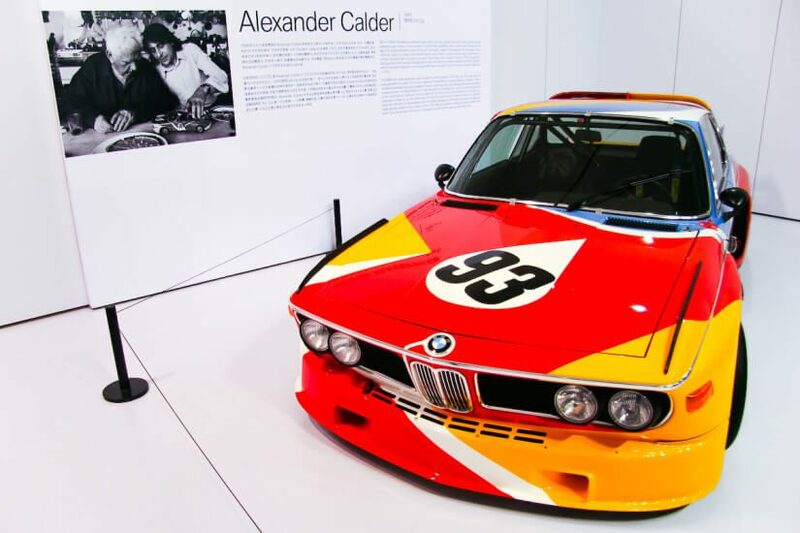 Almost as famous the race cars themselves is the very first BMW Art Car painted by Alexander Calder in 1975. Whenever a genuine UK market BMW E9 3.0 CSL comes up for sale, one has to pause a moment to gaze at the awesomeness that is the roading going version of the performance racer. 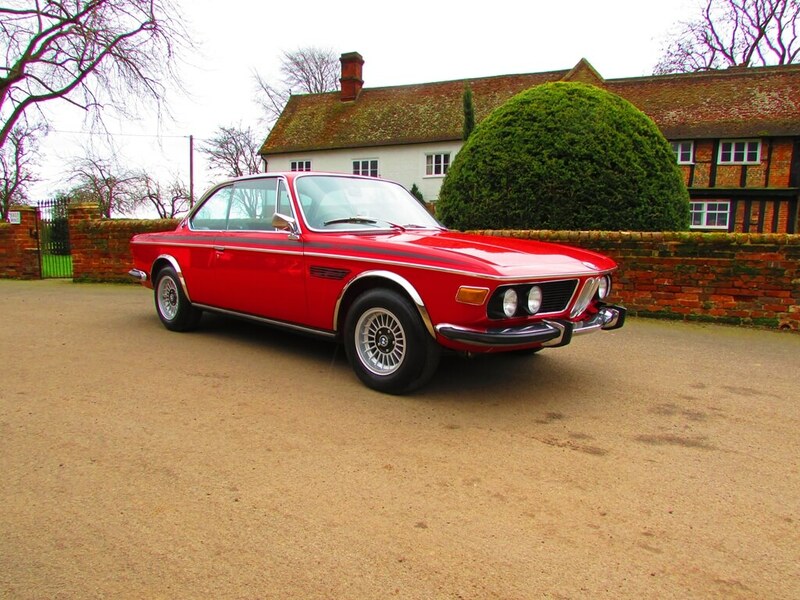 Just 500 were built for the UK market, which makes the 1973 BMW E9 3.0 CSL being offered at Classic Centrals Auction on the 28th February very special indeed. This E9 looks very smart in Verona Red. 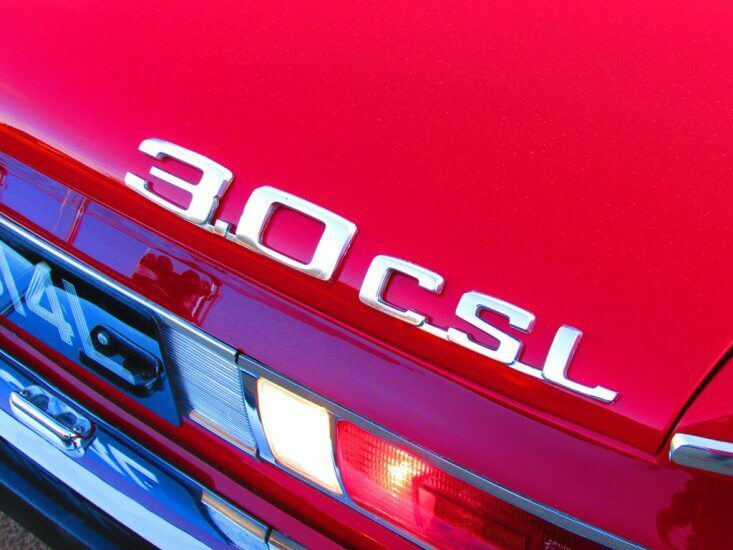 Described as being in concours condition, this CSL is finished is Verona Red (one of only four colors offered on early carb cars) and has been restored. It features the correct specification Scheel bucket seats and the model specific steering wheel. Also fitted are the correct 14” Alpina alloy wheels. 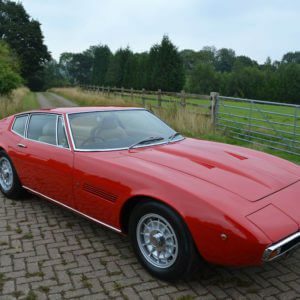 The car is said to have been dry stored for many years and was fitted with uprated Bilstein 6 shock absorbers and factory-correct brake calipers during its restoration. As this is a UK market CSL it is also fitted with electric windows. The interior of the road going 3.0 CSL is a lot more plush than the stripped out racers. While the road going UK specification BMW E9 3.0 CSL, especially those fitted with the City Package were a good deal heavier than its light weight racing brother, it is still a highly sought after performance coupe. The lines of the 1970s CSL are impressive even today and even without the wild Batmobile body kit, it looks purposeful. Everything from the classic kidney shaped BMW front grill, to the quad headlights, the chrome trim on the wheel arches, the iconic black side strip to the superb pillarless profile just scream class and sophistication. We think Verona Red is a great colour on this fuel injected CSL and contrasts very nicely to the black interior. And of course the classic black side decal unique to the 3.0 CSL is just brilliant. A very simple detail but so effective. The engine that makes BMW fans go weak at the knees. We have always had a thing for BMW coupes and the 3.0 CSL is one of our all time favourites. We particularly love the pillarless profile, which is by far the cars greatest feature for us (yes the engine is pretty awesome too). As classic touring car coupes go, this CSL is up there with the best. It might not have the blistering performance of the light weight racer. But what it does have is the creature comforts that make it a car you can live with everyday. With so few built (an estimated 250 of the original 500 are though to survive today) and given this cars concours condition, its Auction Estimate of £90,000 – £95,000 is pretty much spot on. And it reflects the current market for what is a very rare and desirable BMW. It would make an impressive addition to any collection. It will certainly be one to watch. And the badge that makes BMW fans go weak at the knees. 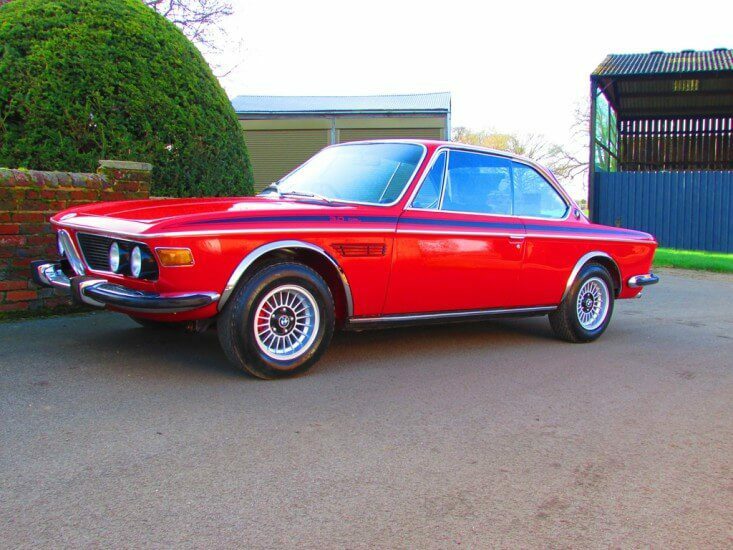 This BMW E9 3.0 CSL carries an estimate of £90,000 – £95,000 and is offered for sale at Classics Central Auctions on the 28th February. More details on this car and the auction can be found here.